A real dream tour is the KeaRider 14 day Route 66 motorcycle tour Dream, where you will get to know several states in detail along the route. Discover the dream of great freedom on the endless straight highways of the American west on this road trip. Visit fascinating natural wonders like the Grand Canyon, Monument Valley with its bizarre rock formations, and the Petrified Forest. During the Route 66 motorcycle tour, cozy biker bars and owner-managed restaurants with delicious American specialties await you. Get to know the culture of the Native Americans for one night at a Navajo reservation, and try your luck at one of the casinos in the glittering metropolis of Las Vegas. The KeaRider Route 66 motorcycle tour leaves nothing to be desired. After an individual journey, tour participants meet in Chicago and cruise after a stop at the Route 66 Hall of Fame through the State of Illinois to Springfield. On the second day you ride on to St. Louis, the Gateway to the West of the Mississippi River, where you have the opportunity to ride to the top of the 190 meter high Gateway Arch. The rest of the day is free to your disposal. After leaving St. Louis behind, you will drive to the Meramec Caves, interesting limestone caves, which formerly served as a hiding place for outlaws such as Jesse James. Now you can hit the gas pedal on your motorcycle tour: the whole day you will spend in the saddle of your Harley on the way through Missouri, Kansas and Oklahoma. Accommodation is in Oklahoma City. Over the famous bridge with 38 arches you will cross the Canadian River on the way to Clinton, where you can visit the Route 66 Museum. The trip continues on to the Cadillac ranch near Amarillo, the final stop for today. 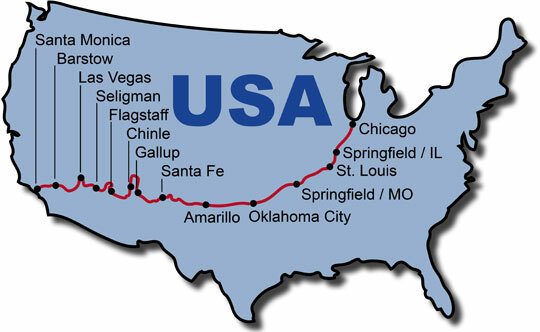 On the sixth day, half-time is reached: in Adrian, you have covered exactly half of the Route 66. Accommodation is in Santa Fe. A first stop in the morning is in Madrid, where the biker film "Wild Hogs" was filmed with John Travolta before you cruise through the exciting desert of New Mexico to the Laguna Pueblo. You will spend the night at the famous El Rancho hotel in Gallup, where Hollywood celebrities such as John Wayne and Humphrey Bogart spent the night. Today, the motorcycle tour heads north to the unique Monument Valley. Then visit the Navajo Indian reservation in Chinle, where you will also stay the night. Exciting nature is back on the agenda: Painted Desert, Petrified Forest and the 170 m deep Meteor Crater by Winslow will inspire you. Accommodation is in Flagstaff. A further highlight awaits you this: The Grand Canyon. You have the possibility to fly in a helicopter before you cruise through the desert to Seligman, where you will visit the Route 66 Visitor Center and buy souvenirs to your heart's desire. Over the famous Hoover Dam you will reach Las Vegas, the city of fortune. You will spend the night there and have the opportunity to see evening shows and hit the casinos of the city. A more beautiful desert stretch leads you today to the old "Wild West" and to the ghost town of Calico and you will continue on to Barstow. From Barstow you will cruise the last miles on the Route 66 to Victorville and then take the Interstate straight to Los Angeles, where you start your individual journey back home.